Walter Simonson on CAPTAIN GINGER: "Not Quite a Cat Person"
June Brigman launched her artistic career in 1983, after moving from the then-rural outskirts of Atlanta, Georgia, to metropolitan New York City. She scored a chance to draw Power Pack, Marvel’s saga of preteen superheroes, and the rest is comic book history. Today, she draws the iconic Mary Worth comic strip, which runs in newspapers nationwide. With her husband, Roy – also an acclaimed artist – she draws CAPTAIN GINGER, the tales of super-evolved cats in outer space. She spoke on the phone with AHOY publisher Hart Seely, who overcame perilous technical difficulties. Did you just get a phone call and there was, like, nobody on the line? Yeah, I could hear you saying, “Hello, hello?” It was kind of staticky, like back in the day when you’d be trying a transatlantic call. I was trying to finagle this recorder. Hold on. Not a great first impression as tech wizard. Listen, if I can take a cell phone video of my cat, I feel technologically advanced. Okay, it’s… I think we’re taping… so… with CAPTAIN GINGER, a book about space age cats, I take it you’re a cat person, rather than a dog person? Actually, I’m an animal person. If I had my way, I’d have about 10 acres with a little barn, and cats, and dogs, and pigs, and horses, and donkeys, and maybe a few little goats. You’d be living the life. Yeah. But I’d never get any work done. I’d spend all my time taking care of the menagerie. Critters take a lot of care. You do own cats, though, right? Oh yes, I have ten. All with names and personalities? They’re all unique little individuals with their own characteristics, personality traits, and likes and dislikes, which they let us know. Eight are in the house. One is in my studio, separate from the house, and one is outdoors. They pretty much get along – occasional dust-ups, nothing serious. But it’s a lot of fur. Is there one who could be Captain Ginger, the leader of a star ship? I had two that were much like Captain Ginger and Sergeant Mittens. When we moved to Atlanta, they came with the house. 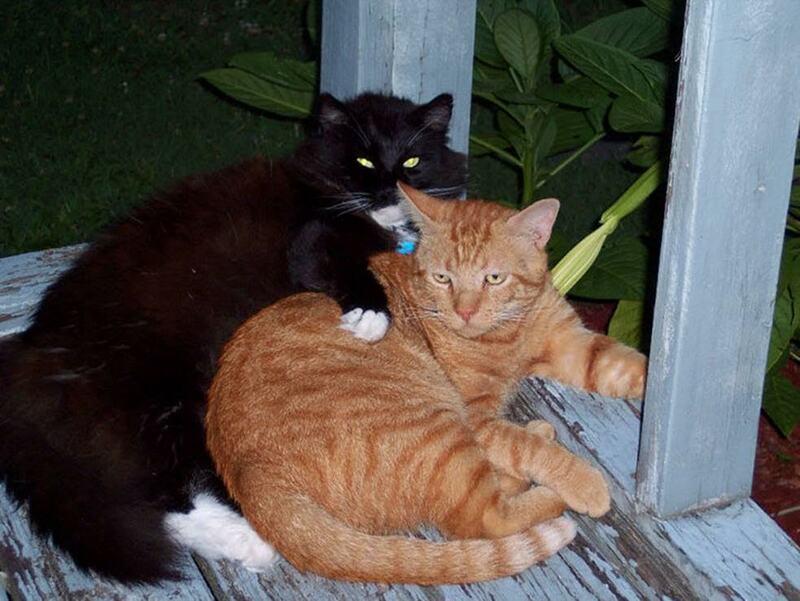 They were living in the garage—grown cats, males—and I can’t say they were best buddies. It was a love-hate relationship. One was an orange tiger cat, just like Captain Ginger, and the other looked much like Mittens – a big bruiser with this thick, long, black coat. They went everywhere together. They were kind of my inspiration for those two in the comic. You must have a whole cat community. There are followers and leaders, cats in charge and cats who are completely passive, and cats who get pushed around and cats that are pushy—all kinds of cat politics. Is there one who, when he looks at you, sees into your soul? Her name is “Emma Frost,” after the character from the X-Men. She’s solid white. She was fully grown, living outdoors, a neighborhood stray, when I found her. I wouldn’t say she was completely feral, but it took about two months of sweet-talking and treats before I could even touch her. But once she came inside, she was different altogether. She kind of rules the roost. She’s definitely one of those cats that, when you talk to her, you feel she knows exactly what you’re saying. There’s that weird connection that crosses species. You and your husband grew up in Atlanta, right? Roy and I were both born in Atlanta, raised in Atlanta, went to the same school system – all 12 years. He was a year ahead of me in high school, and we both moved to New York around 1983. We lived there for 25 years. How did you make the transition to New York? There was culture shock, because we were a couple of hillbillies. I mean, we were from Atlanta, out in the suburbs, which back then was pretty much country. We had never lived anywhere else. We came to New York for a visit and made the rounds at the Marvel and DC offices. From that, we decided to move there. It was pre-Internet, and while you didn’t have to live in New York to work in comics, it was definitely an advantage. But we were staying with a friend who lived in the Bowery – before it became gentrified – and it was so expensive, so dirty, and so loud… I couldn’t deal with it. We met an artist named Paul Smith, who was working on X-MEN, who lived in White Plains, about 30 miles north. We went to visit him and it was, Okay, this, I can deal with! We settled there. You could pop onto the train and be in Grand Central in 30 minutes, so we had the best of both worlds. Was it hard, dealing with Yankee northerners? I don’t remember a hard time. I loved going into the city. There was a very different attitude. I’d be standing there, looking at my subway map, and people would stop and say, “Can I help you?” And living in the suburbs made it easier. Around then, Atlanta had become a hub of the New South, right? During the eighties, with the real estate market, it was a boom town. We actually grew up in Gwinnett County, outside the city, one of the fastest growing counties in the nation. When we moved back here, after being away for 25 years, we didn’t recognize the place. All these communities, they used to be cow pastures, literally. It’s a huge change. Better and worse. Worse, in terms of traffic. A lot of farmland is now strip shopping centers. Better, in terms of diversity. You’ve taught at the Atlanta campus of the Savannah College of Art and Design. Tell me about your students. Well, when I was in college, if you were interested in doing comics, you didn’t mention it to your professors. It was not seen as a career path, or a viable art form, or anything. Exactly. If you were into comics, you were a nerd. It wasn’t mainstream at all. Now, it’s cool to be a comic book artist. But I think a lot of students have a misconception about it, in part due to the movies’ popularity. Students—and parents—think if you’re a comic book artist, you’re going to make money. Actually, there isn’t much of a trickle-down from the movies. Sales are not what they were when I was starting out. There are more publishers, but most of the small indie companies don’t pay a living wage. There’s also a ton of competition, because you have schools like Savannah turning out kids with degrees in Sequential Art. It’s a very competitive market. Do they have an unrealistic view? Some do. But a lot of students don’t really think about the money. They just love drawing comics. I think they’re willing to work day jobs just to make their books and to tell their stories, and not worry about money. When you broke in, was the business a bastion of male dominance? Yeah. It was very male-dominated, but not so much because of sexual bias. There just weren’t that many women interested in drawing comics. That’s another thing that’s changed. The classes I teach have as many young women as men. I think that’s the influence of Manga, which brought a lot of young women into the field. As for how it was in 1983? I can only speak from my experience. Everyone has a different story to tell, but I never felt I was being judged as a woman artist. I never felt bias or prejudice. I think I was just lucky to get in at a time when the companies were producing so many books. I was in no way prepared to start working professionally. I had no experience and was self-taught, and all the sudden, I’m drawing a monthly book. It was sink or swim. What do you think she meant? She meant my style was inappropriate for the book. I mostly got books that were “girl-oriented” – female or child characters – though I worked on Alpha Flight for a while. My style wasn’t really suited to big, beefy, superhero books, so I think if there was bias, it was more based on my style than gender. Do women draw differently than men? Some do, and some don’t. There are men who have detailed, delicate styles that could be considered feminine, and there are women who can draw the superhero stuff. For example, Sara Pichelli—whose work I love. She does a great job on Spider-Man. Just being a man, just being a woman, you’re coming from different places, but I honestly don’t know if it makes any difference. Growing up, how did you get hooked on comics? Well, growing up, I never read comics, never even looked at a comic book until I met Roy. It wasn’t that my parents forbade me to read comics, nothing like that. And if there had been a comic book about a girl and her horse, maybe I would have read it. But I wasn’t interested. When Roy and I started dating, around when I started at the University of Georgia, I wanted to major in art, and to do something where I could make a living. He’d read comics as a kid and had a big collection, and I remember him showing me Jack Kirby’s FOURTH WORLD stuff, an issue of the NEW GODS. He had to show me how to read the panels. I just remember sitting there and getting sucked into that world – drawings on a page. We went to a comic book convention in Atlanta—it was back before cosplay and the movies, so it was just about comics, and all these amazing artists were there… Gil Kane, and Michael Kaluta, and Bob McLeod. I just thought, Yeah, I’d like to do this. That’s how I caught the bug. So, you just went to New York City without a job? I had one little job. DC was doing New Talent Showcase, and I had sent in samples and done a little work. The guy who had written it, Steve Ringgenburg worked at Marvel. He said if we wanted to visit, Roy and I could stay with him. That was back when if you could get in the door, you could walk from office to office, showing your portfolio and meeting editors. I got a back-up story in Conan from Larry Hama, and on that same visit, I met Louise Simonson, who had this idea for Power Pack. She asked if I knew how to draw children, and I said, yeah. That night, I went back to Steve’s and did some drawings, and next day, I brought them in. She liked them. We put together the proposal for Power Pack and (then Marvel editor-in-chief) Jim Shooter said, let’s do it! You’re describing an artist’s dream fantasy. Is drawing comics a lonely profession? Well, I’m lucky in that my husband does the same thing. Sometimes, it’s a little scary, both of us being freelancers. But we have a separate work space. We have our meals together, and we have somebody to talk to and share a living space with. Also, teaching gets me out and interacting with people. But there are days where we don’t leave the house. So, you get to work in your sweatpants! Are you kidding? Sure! Yeah! When I have to go out, and it means putting on a pair of blue jeans, it’s, oh my god, these clothes are so tight! I have this pair of overalls—Roy hates them, just hates them! – but I understand why old guys like them so much. They’re comfortable. Yes, my incredible schlubby, schloppy, comfortable work clothes! You’ve drawn two of the most iconic female characters in comics history – Brenda Starr and Mary Worth. When you took over those strips, did you feel pressure? I did with Brenda Starr, because I’d never done a comic strip before, and I grew up reading Brenda Starr. I felt pressure to live up to the history of the character and strip. Plus, I was following in the footsteps of two amazing artists in Dale Messick and Ramona Fradon. I did Brenda for 15 years, and later, when I took over Mary Worth, at least I kind of knew what I was getting into, so I was more relaxed. Did you get pushback at first from Mary Worth readers? Oh yes. Not so much from letters, but on the website, Comics Kingdom. When I took it over, there was a lot of hate. The fans live with an artist for so long. I mean, Ramona Fradon drew Brenda for, I think, 15 years, and then Joe Giella was on Mary Worth for something like 27 years. So, rabid fans went after you? Yeah. I mean, I don’t draw like Ramona Fradon. I don’t draw like Joe Giella. I had my own vision of what Mary Worth would look like. She was still recognizable, but a little more updated, and the fans hated it, for a while. Eventually, they accepted my style. How did you deal with the backlash? I stopped reading the comments. (Laughs) I just stopped. When we start a new story arc, I’ll go onto the website and interact with fans, but for the most part, the comments are just a big snark fest. Some people love to be mean. It’s not that I don’t care what the fans think, because – well, for one thing, if they’re commenting, it’s because they’re reading it, and as long as they’re reading it, that’s fine with me. But the opinions that really matter to me are my husband’s, my editor’s, the writer on the strip – Karen Moy – and my fellow artists. Which are tougher to draw… people or cats? But you have to give them human characteristics. They’re pretty anthropomorphic, but I wanted to keep them as catlike as possible. It’s not as exacting as drawing people, although I still think things like, “This cat’s ears should be bigger” or “This cat’s nose needs to be shorter.” My style is a little freer, more expressive, with the cats. What’s the toughest emotion to draw? Oh, I don’t know, skepticism? The extreme emotions are easy – surprise, anger, even distrust – but the subtle ones, like skepticism are tough, and Stuart (Moore, writer of CAPTAIN GINGER) writes a lot of subtlety into scripts. You draw skeptical cats in space suits. It’s an incredible piece of work. This weekend, there was a convention here in town, and we had friends for dinner. One was an old and dear friend of ours, Bob McLeod, who helped me a lot when I was starting. If I were to have had a teacher, I would say it was him. He said he thought CAPTAIN GINGER was the best work of our careers. And I agree.